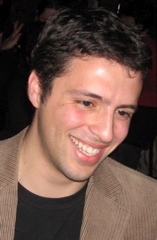 Ezra Klein: Dude! You Gotta Get a Dell! Dude! You Gotta Get a Dell! So remember that new Macbook? The one you readers kindly helped purchase? The one I bought exactly 38 days ago? Yeah, it stopped working. It just spends some time on the initial grey screen, then transfers me to the normal boot-up screen, then leaves me watching the spinning wheel o' death for as long as I care to stare at it. The fine folks at the Apple store -- which I stopped at on my way back from the airport -- helpfully informed me I could...come back tomorrow. During work hours. Thanks guys. Update: When I try to start up in safe mode, holding "shift," the computer turns itself off. Huh. Now We're Getting Techie Update: I started in "verbose" mode and the hangs appear to be "disk0s2: 0xe0030005 (undefined)" (which I've no gotten six dozen times) and that "localhost memberd can't find the root user." Does this mean anything to anyone? Well, it was nice knowing you. Be sure to write from Steve Jobs' reeducation camp. Because obviously you aren't clued in to the inherent superiority of the Macintosh experience. Your computer knows that you have been spending too much time with it lately, and it is just telling you to go to the park and play on the swings for a little while. When you get back, it will be waiting for you. Trust the Apple product. Apple knows what you need. The Macies used to laugh in uproarious fashion when the pre-Windows 2000/XP crashed with the 'blue screen of death', saying that the only real PC was a Mac. At least blue was a soothing color. BTW, they also used to joke at length about the security vulnerabilities of Windows and Internet Explorer, before Mac and Firefox started having similar problems. HP is the new Dell, btw. I'm sure the fix for your Mac is something simple like a new motherboard, new hard drive, or the entire innards. I would suggest a IBM/Lenovo Thinkpad. I travel a fair share and have used a number of laptops including Dell's and I've found the the Thinkpad to be the toughest, most reliable of the bunch. Seems like something similar happened with the Powerbook I occasionally use for work, and it was a password-setting issue. My brother walked me through the fix (mocking me the entire time, of course, but that's a family thing, not a Mac one)... he's surly but effective. So you learn the hard way. Now, slowly step away from the dark side . . . and toward the PC. The two error messages suggest that the bootup portion of the OS can't find the disk (and therefore can't find the root user). I'd suspect the disk controller if this was Windows XP. But then I'm clueless on Macs. It means - ehh, I can't be too snarky. Sorry about your computer problems. It's a shame that Apple doesn't have a tech support team in place, since no one has ever had a problem with any of their products before. Hey! I guess I can get snarky! Don't own a Mac without it. Jim: modern Macs are getting progressively more like PCs with each passing moment, at least in terms of internal architecture. I'd say your suspicion is likely spot on. Hopefully its just the HD controller, and not the disk itself. Just a note to say that I've been using Macs since 1985 and have never had that serious a problem, particularly with a machine that new. Any mass-manufactured product will occasionally turn up defects, so I don't think that's a reason to laugh at Apple. Don't know why the Apple store couldn't take your machine on an emergency basis right then and there. I have an independent one a couple of blocks away that will take mine and give me a renter any time they're open, and they're open 7 days a week. So some of us are just lucky Apple users, I guess. in my experience, disk controllers have a much longer life than hard disks. in addition, at least the HD can be swapped out by someone at apple (or maybe the architecture of the newer macs lets the user do it, i dont know - they dont have a good rep with me on that point), if the disk controller is fried, that means they have to replace the motherboard. yes, it's still under applecare, but if it were simply the hd you could swap it out and keep on truckin, as it were. rather than send it in and wait. When something so new is going south odds are good it's a hardware problem. Apple is not immune to hardware breakdowns; no manufacturer is. That's a fantastically laughable comment. Ezra, I'd agree that this sounds like a hardware problem; you should be covered by your one-year warranty (although I'd recommend ponying up for the three-year AppleCare plan). I personally think that Apple's build quality has gone down in the past few years -- they're better than Dell is at the moment, but worse than Lenovo/IBM. If you're going to be a Mac user for the next few years, do what Spork says and buy DiskWarrior. Ezra, sorry to hear of your troubles. Also sorry to read the apparent insecurities and inferiority complexes of your commenters. I know there are Mac zealots, but jeez, you'd think there were no such thing as PC zealots or Microsoft zealots either. Meanwhile, those of us in the "center" (ha) know that statistically all computers have hardware failures, and all new hardware has a chance of being a lemon, even apples. So, again, sorry, but if you purchased the Apple Hardware Protection plan, as everyone getting a laptop should, you should bring it to your nearest Apple Store ASAP. After a little wait, you'll get the help you need. It may need to go in but you'll get it repaired or replaced inside of a week. You almost certainly have a failing hard drive. Even if you don't, it is best to assume that whatever access you have to the data there is fleeting (since everything else can be replaced); back it up if possible, contemplate other strategies for replacing it in any case. Hard drives follow a "bathtub" failure curve: some fraction fail early, then there are a few years of relatively little failure (other than external causes like bumps and drops) and a slowly rising curve after that. Yours is an apparent "infant mortality." Apple uses the same hard drives as everyone else. In fact, hardware-wise there isn't a whole lot of difference between the Intel-based Apples and other computers any more. It's all in the software and the externals. Go over to MacFixit (www.macfixit.com) and see whether there are reports of this probelm and possible solutions. They are the place to monitor for problems with the software or hardware in newly released Macs or system upgrades. Well, Ezra don't delete that error message about memberd not finding the root user. It's the 3rd hit on a Google search for the error message, so whatever you end up doing to get it fixed (or replaced or whatever) put a note so other people can find an answer faster in the future. As others have said it's almost certainly a very unlucky hardware problem. Ubuntu wouldn't help a bit. Gotta say I'm dismayed at the hardware failure rate of Apple products in more recent years. I still have a PowerMac that I bought in 1996, and it still proves useful in a pinch. It has never had a single service issue, with the exception of the monitor which started flickering badly when it was 7 years old. I replaced it with one off Ebay for $25, and it still works. But in the last two years, my daughter and son each bought iPods that went back to the store for hard drive issues within three months of purchase. Ditto my son's MacBook that he bought this spring. And now you, too, Ezra? Someone above noted that all the internals are pretty much created equal, and this is true, though it's actually worse than that. On computers, and most other consumer electronics, designers and engineers lay out specs for certain components (chips, motherboards, drives, power supplies), and then they are bid out to contractors, usually factories in various pacific rim countries, who must supply the parts in massive volumes. In some cases quality control at these component factories is good, and in other cases, well, they aren't up to the extreme volume required (e.g. iPod, iPhone). Boot off the CD and do an archive and install. Keeps all your documents safe in your user account, and reinstalls the System and Library folders should be able to access the OS then. (If not, it for sure is a hardware issue. Although technically this IS a hardware issue, with data degradation on the HD. I'd then back up your files and do a full HD format and reinstall. OK, you are likely to have a corrupt system file (and maybe a corrupt hard drive). Start from the CD. Run the disk utility from the CD to check the hard drive. If the hard drive utility can repair the hard drive, try to restart from the hard drive. Otherwise, back up your data, reformat the hard drive and reinstall the system . Karmakin is right, an archive and install should do the trick. What Dan Karreman said: Disk Utility from the Tiger Install DVD.